Language barrier could be a major issue when you found yourself in a foreign place. A great translation app could be of help if you’re exploring different places and uncovering different cultures around the world. Likewise, talking to different people completes the experience. It’s a good thing that in today’s modern world, there’s an app that could connect bridges when it comes to language. 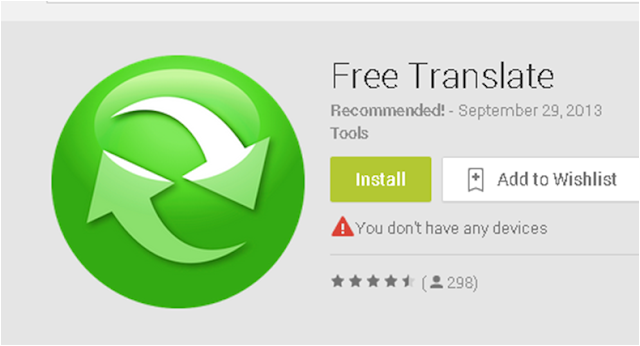 Free Translate is an Android app currently on version 5.0 and supports Android 2.2 Froyo and up. This app makes it easy for users to text-translate any language into 40 different languages. Despite having a very intuitive user interface, this app comes free on Play Store which sets it apart from other expensive translation apps in the market. The simplicity of the app is the deal maker. It’s easy to use, especially the copy function. Aside from Google Translate, there’s no other translation app that could translate words, phrases or webpages the way this app does. Using the app with an internet connection is just a walk in the park. The interface is pretty simple, when you open the app, you’ll get to choose your default language and you’ll go from there. The translation server is fast enough to give you service in the instant that you needed your stuff to be translated. But of course, you’ll need an internet connection to optimize the app’s usage. The only downside that I’ll point out, it’s uneasy for me to use the app without an internet connection. The app isn’t perfect, but it really does the stuff that it is expected to do. Free Translate is a capable app that could get you through translating needs. The app surely needs a lot of update. However, function-wise, it is a great companion for you translation needs. You can get it free on the Google Play Store in the link provided below.